The UFC expects next month’s UFC 189 event to be one of the biggest in the company’s history, and officials have finalized one hell of a lineup for the show. UFC 189 takes place July 11 at Las Vegas’ MGM Grand Garden Arena, and the main card airs on pay-per-view following prelims on FOX Sports 1 and UFC Fight Pass. 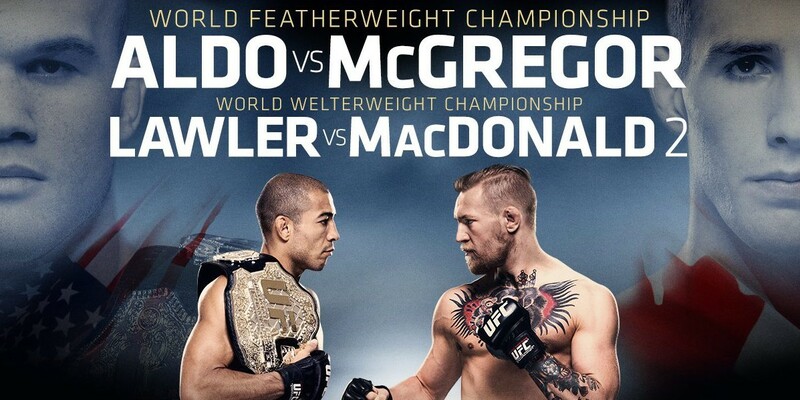 The centerpiece of the fight card is the long-awaited bad-blood grudge match between long-reigning featherweight titleholder Jose Aldo (25-1 MMA, 7-0 UFC) and challenger Conor McGregor(17-2 MMA, 5-0 UFC). In the co-headliner, welterweight champion Robbie Lawler (25-10 MMA, 10-4 UFC) looks for his first title defense when he takes on Rory MacDonald (18-2 MMA, 9-2 UFC). The rest of the PPV main card features some veteran talent: featherweights Dennis Bermudez (14-4 MMA, 7-2 UFC) vs. Jeremy Stephens (23-11 MMA, 10-10 UFC), welterweights Gunnar Nelson (13-3-1 MMA, 4-1 UFC) vs. John Hathaway (17-2 MMA, 7-2 UFC), and bantamweights Thomas Almeida(19-0 MMA, 2-0 UFC) vs. Brad Pickett (24-10 MMA, 4-5 UFC). But there’s not much of a drop-off with the preliminary card. In the featured FOX Sports 1-televised prelim, welterweight contenders Matt Brown (19-13 MMA, 12-7 UFC) and Tim Means (24-6-1 MMA, 6-3 UFC) square off, and the card also features 170-pounders Brandon Thatch (11-2 MMA, 2-1 UFC) vs. John Howard (22-11 MMA, 6-6 UFC).